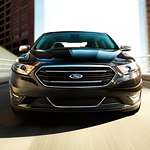 Although the Ford Taurus might seem like a family sedan, it offers numerous interior features that provide comfort and luxury while driving or riding in West Covina. Materials used for the seats and other components inside the Taurus are soft and almost like a pillow. Your hands can stay warm on the coldest days with the heated steering wheel. The front seats of the Taurus area heated and cooled, a feature that is sure to make a difference in extreme temperatures. The colors inside the vehicle have been refined so that they are warm and inviting. Plenty of insulation is provided in the vehicle to allow for a smooth and quiet riding experience. Front seats are a bit wider than in previous years. Listen to your favorite music as it's played on one of the 12 speakers in the car. Ford of West Covina can set up your navigation and audio system along with the interior lights that include blue and green.